For enhanced performance and quick loading, widgets are displayed in cached mode while being edited in an existing report. Widgets in cached mode display old data and are presented with a white filter layer. To view current data for a widget, click Refresh. To refresh data for all widgets in an edited report, click the Refresh button in the Top Toolbar. Reporting data caching is enabled by default. The cached data is stored in the database for 182 days. In order to configure the number of days for storing cache, go to Administration > System Configuration > Reporting Data > edit "Cache lifetime in days" and click Save. In order to disable reporting data cache, go to Administration > System Configuration > Reporting Data > un-check "Enable Reporting Data Caching". In order to delete the reporting data stored in cache, go to Administration > System Configuration > Reporting Data > click on Clear Cache. 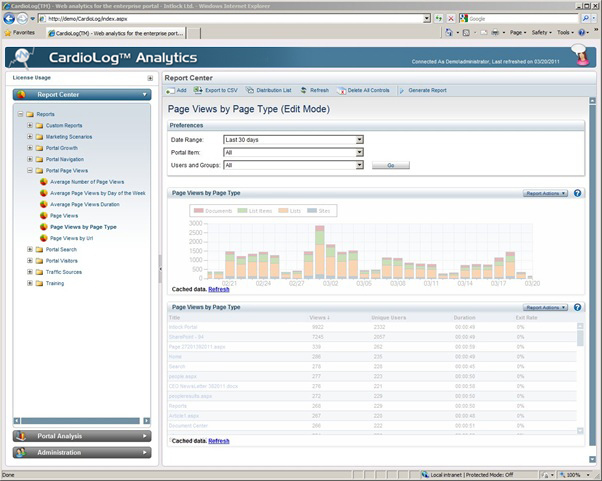 CardioLog Analytics comes out of the box with a license limit of page views per month. This license limit can be increased for an additional fee. Unlimited license package is available. When reaching 85% of your monthly page view license quota, a warning will be displayed in the CardioLog Analytics user interface. When exceeding the allowed number of page views per month, the user interface will be blocked. Event collection will continue, however, the extra events will be sent to quarantine. In order to un-quarantine usage data upon purchasing a new license, go to Administration > System Configuration > Reporting Data > click on Unquarantine All.